The Anesthesia Machine Model 1 is compact, robust and flexible, easy to move and was designed for military field hospitals, general civilian hospitals, office-based anesthesia and surgery centers of every description. 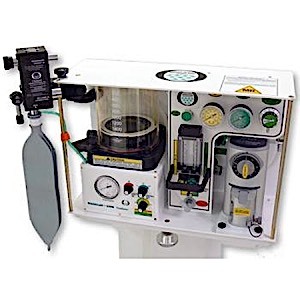 The Anesthesia Machine Model 1 is pneumatically powered and may be mounted on a table top or mobile cart. The Anesthesia Machine Model 1 is designed as a simple to operate unit containing all of the modes and necessary components to deliver a basic anesthetic, including a mechanical ventilator and a single agent vaporizer. All of the safety systems required are employed onboard and easy to utilize. Physiologic monitoring of the operators choice, may be employed as a separate, but necessary device. In standard use, the Anesthesia Machine Model 1 may be used with a variety of face masks, endotracheal/tracheostomy tubes and other approved artificial airways that are a standard in any operating theater. Operating Temperature Range 35 to 110 degrees, F.
CO2 Absorber Holding Bracket Plastic, secured with knob to main frame of machine. Bag-Ventilator Switch/PRV and Scavenger Outlet Port Hand-operated selector switch and rotating knob for PRV and scavenging outlet. Gas Inlet Manifold Filters Located behind Manifold Air and O2 inlet male connectors. Alarm on/off Labeled toggle switch located on body of alarm box. Indoor + 160 Deg. F Allow unit to warm to room temp. Outdoor -30 Deg.F Allow unit to warm to room temp.